Korat breeders and owners have always prided themselves that the Korat is an ancient breed, traced back to imports from Thailand and only ‘blue’ cats are Korats. The Standard of Points called for blue only, but the Korat doesn’t only produce blue kittens. From the earliest days of recorded Korat breeding in the west (1959), kittens have been born occasionally with a Siamese type pattern, pale body with some shading, but the blue colour restricted to the points (face, ears, legs & paws, and tail). In other parts of the world these have been, and still are, considered Korats with a blemish, in the same way as a kinked tail or a white patch makes a cat unsuitable for the show bench. Therefore, when in 1989 two Korats mated together in the UK gave birth to a ‘pink’ kitten, it was a bit of a surprise, to say the least. In the late 80’s and early 90’s other UK based Korats gave birth to the odd ‘white’ and ‘pink’ kitten. It became clear that these new ‘colours’ (although one is really a restricted coat pattern) were derived from recessive genes, dormant in the Korats for many generations and coming together to either ‘dilute’ the coat colour, in the case of the Thai Lilac, or restrict the coat colour to a Siamese type, pointed, pattern in the case of the Thai Blue Point. Some people wonder why these cats are not simply called Lilac Korats and Blue Pointed Korats, if their parents are Korats? But remember, the word Korat in Thai (Si-sawat) means blue cat, and indeed, the Korat is defined as the blue cat of Thailand. That means any other coloured cat, regardless of parentage, cannot qualify for this definition. Therefore names were coined that described both the colour and origin, but also respected tradition, according to breeders’ wishes. So where did these genes come from? The origins must lie somewhere back in the mists of time in Thailand. Sealpoint Siamese (Vichien Mas), Korats (Si-Sawats) and Copper cats (Thong Daeng) all existed as recognised Thai cats several hundred years ago and have been developed as Siamese, Korats and Burmese, distinct and separate breeds in the west since the beginning of the 20th century. Each breed carries a genetic legacy from their country of origin. 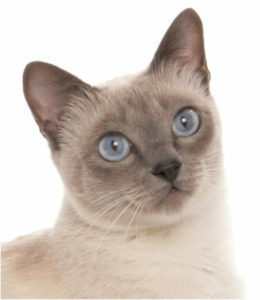 It is on record that the Korat is thought to have added the ‘blue’ to the Blue Point Siamese, possibly the Burmese acquired their blue genes from this source too. It’s not really very surprising that a few Korats gained added extras in return. In the UK another colour or coat pattern is classed as simply different, it can’t be listed as a fault. Many UK breeders embraced these ‘different’ cats and so two new breeds were declared for UK registration with GCCF, the Thai Lilac (34c) and Thai Blue Point (34 40 2). Once their existence was acknowledged it was left to breeders to decide whether they wanted to select for the Lilac colour or Blue Point pattern, or ignore these and try to breed away from them. There was one condition. The ‘different’ cats should qualify for a show bench place on their own merits, as separate breeds from the Korats. Preliminary Recognition was granted by GCCF in February 2002 and Thai Lilacs and Thai Blue Points were shown in Thai assessment classes. The Thai Lilac had a 100% show record with every Thai Lilac shown earning its Merit Certificate. The Thai Blue Point didn’t achieve a 100% record of Merit Certificates but it’s not far short of this. Provisional status for both, was successfully applied for in October 2008 and the Thais moved up to compete for Intermediate Certificates from June 2009. Hopefully, it won’t be too long before we achieve Championship status for the Thai cats who came out of the Blue! The Thai Lilac is a unique cat who will eventually get the awards it deserves. The same Standard of Points applies to the lilac cat as does to the Korat with an exception made on the colour of the coat. This should be “lilac of a warm pinky-beige tone, tipped with silver. A lilac cat with a silver tipped coat and large, expressive, clear green eyes – truly, winning and appealing qualities. 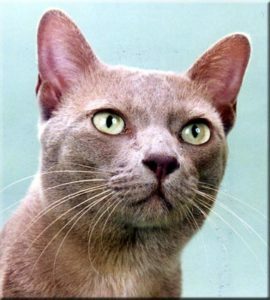 Again, the same Standard of Points applies to the blue pointed cat as does to the Korat with an exception made on the colour of the eyes and coat colour and pattern. The Standard of Points calls for a heart shaped face, large blue eyes and a body colour of off white with some shading allowed on back and sides to tone with the points. The blue points should be tipped with silver. Soundness to the roots, does not apply. With such attractive qualities demanded it surely won’t be long before the Thai Blue Point wins a special following of its own. Korats or Thais – That Is The Question? Both recessive genes can be identified by DNA testing using a simple cheek swab so it is very easy to select a cat which either does or doesn’t carry the recessive siamese or chocolate gene, if that is important to your breeding programme. Some Korat breeders prefer to keep the “blue” line and are deliberately breeding their cats to ensure that neither recessive gene is present. Others, are deliberately mixing the dominant blue and recessive genes to produce Korats, Thai Lilacs and Thai Blue Points, which because of the ancestry of these wonderful cats, still conform to the Korat Standard of Points and have that delightful Korat temperament. To all intents and purposes, the Thais are simply Korats wearing a different coat. That’s what I love about science, medicine and democracy, it gives us such choice!